Many leftists foolishly treat patriotism like a four-letter word. They believe showing love of country is at best cringeworthy, and at worst jingoistic. Hollywood, which is overrun with liberals, spreads this warped view of patriotism through its films, but two movie stars did a truly amazing thing to honor our military. The second installment of the Jurassic Park reboot is on the horizon. The film is already raking in big money at the international box office, but it won’t open domestically for another week. @JurassicWorld: Fallen Kingdom stars Chris Pratt and Jeff Goldblum pose for a photograph with Joint Base Pearl Harbor-Hickam Sailors and Airmen. The stars of the film visited with Sailors, Airmen and their families before a special screening of the movie. The event was a nice gesture because Hollywood often demonizes the military. That isn’t to say America is perfect, but since the outset of the Vietnam War, a disproportionate number of Hollywood films and television shows has exhibited American soldiers as psychopaths, mindless pawns of a tyrannical war machine, broken people, or some combination of the three. The television show M*A*S*H (succeeding the novel and award-winning film), which launched in 1972, depicted the goings-on at an Army hospital. Though the story took place during the Korean War, the show served as a biting commentary on the Vietnam War. The Korean War was fought to prevent the entire Korean Peninsula from turning into the Gulag state that North Korea has been for decades. That seems like an inappropriate vehicle to push an anti-war agenda. Other acclaimed movies such as “The Deer Hunter,” “Apocalypse Now,” and “Coming Home” all portrayed soldiers as mentally and/or physically broken human beings. Conservative writer/producer Don Bellisario broke the mold by creating the television show Magnum, P.I. which showed Vietnam vets as well-adjusted men who had fun and went on capers together. The show was a breath of fresh air to servicemen. However, the “soldiers and sociopaths” film trope returned to undermine the Iraq War decades later. In the film “In the Valley of Elah,” an investigator looks into a grisly murder that took place near an Army base. It is revealed that the killers were soldiers at the base who killed their fellow soldier for a completely innocuous reason, and felt zero remorse because they had been so psychically destroyed by war. At the end of the film, the American flag is hoisted upside down, the recognized signal of distress. Some members of Tinseltown have a deep and abiding respect for the military, such as Gary Sinise and Michael Bay. Sinise, who has several servicemen in his family, in particular, dedicates a lot of time and resources to helping veterans. One of Sinise’s initiatives was launching a film festival for veterans to act as a counterbalance for all the films that accentuate the dark side of military service. It appears Pratt is following in Sinise’s footsteps, as he has already participated in initiatives to help veterans reintegrate into civilian life. 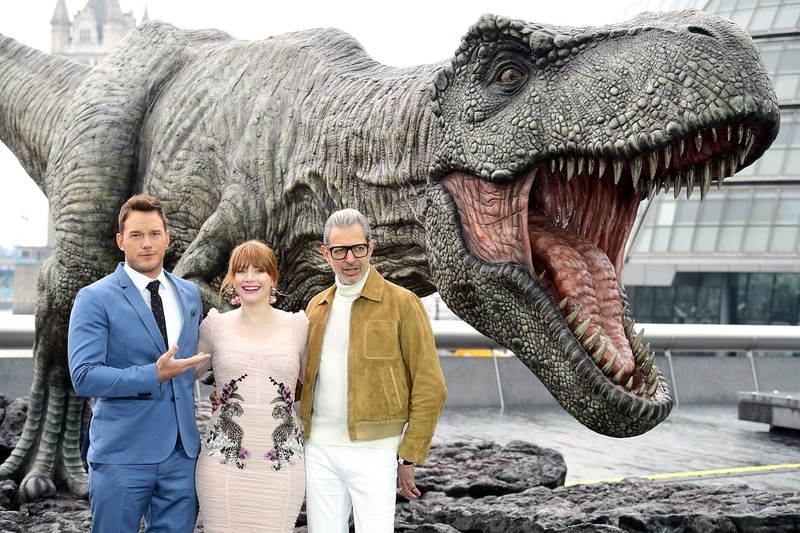 Kudos to Pratt and Goldblum for their kind, patriotic gesture of support.